Lionel Messi would provide the same inspiration if he played for Australia instead of Argentina, said Barcelona head coach Ernesto Valverde after the captain's latest top-class display. 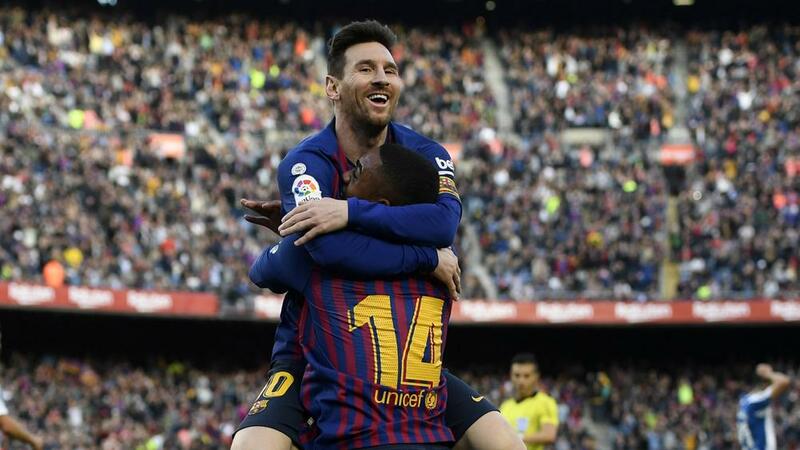 Messi scored both goals as Barca beat Catalan rivals Espanyol 2-0 at Camp Nou on Saturday to take another step towards defending their LaLiga title. On the day Messi moved above Andres Iniesta into second place in Barca's all-time appearances list, he opened the scoring with a free-kick that deflected in off Espanyol captain Victor Sanchez. Messi later added his 31st LaLiga strike of the season to settle the derby, the in-form forward having hit eight goals in his last four club appearances. During the international break, Barca's captain returned to Argentina action after a nine-month absence following the World Cup in a friendly loss to Venezuela. But he was then criticised in his homeland for pulling out of the Argentina squad to face Morocco, with Messi defending his decision by revealing he has been carrying a pelvic injury since December. "Messi would be the same playing in Australia," Valverde told a news conference. "I do not enter into things with his country. "I can only say that, for me, it's a luxury to coach him. We try to make him happy and content, because that makes him much better." Barca are back in action on Tuesday with a trip to Villarreal before facing nearest LaLiga rivals Atletico Madrid at Camp Nou. Valverde must also plan for next month's Champions League quarter-final against Manchester United, who knocked out Paris Saint-Germain in the last round. A congested fixture list could affect Barca's hopes of clinching a treble, eclipsing the Liga and Copa del Rey titles they won under Valverde last term. And the Barca boss - who still feels Atleti can catch his side - accepted he will have to take difficult decisions over team selection, with Messi among those who may be given games off to recover fitness. "Taking into account the calendar we have, we have to throw in the whole team," Valverde added after Barca's fifth straight LaLiga win reinforced their cushion from Atleti. "The games are coming very quickly. We'll see if Messi is one who is rested or not. "Three years ago, on matchday 29, Barcelona had eight points more than Atletico and 12 more than [Real] Madrid. "Four days later, they were tied with Atletico and had one more than Madrid. Things that can happen to us or to anyone."